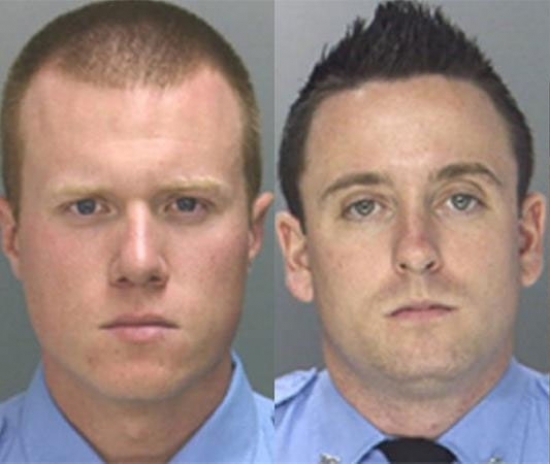 Two Philadelphia Police officers have been charged with beating an innocent man and falsely reporting the incident. Around 10:00 p.m. on May 29, 2013, near North 7th and Somerset streets, Officers Sean McKnight and Kevin Robinson pulled over 23-year-old Najee Rivera who was driving a scooter. During the stop Rivera became frightened and drove away. The officers chased after him in their patrol car without using their lights and siren, which is against procedure. When they caught up to Rivera, they knocked him off the scooter and struck him repeatedly with their hands and batons. He suffered numerous lacerations and fractured orbital bone. The officers said that Rivera fell off his scooter, assaulted Robinson, and resisted arrest. Surveillance video from a nearby store discovered by Rivera's girlfriend eventually showed the grand jury that the officers were lying. McKnight and Robinson have been charged with Aggravated Assault, Simple Assault, Criminal Conspiracy, Recklessly Endangering Another Person, Tampering with Public Records or Information, False Reports to Law Enforcement Authorities, Obstructing Administration of Law, and Official Oppression. Four boys were taken to the hospital this afternoon after coming in contact with a controlled substance at a Southwest Philadelphia elementary school. Police were called to Mitchell Elementary School at 5500 Kingsessing Avenue just before noon where they say a 13-year-old boy brought a sandwich baggie filled with packets of crack cocaine to school with him this morning. The 13-year-old tried to get an 8-year-old boy to hold the bag for him for the day for $7, and arranged to meet him at a corner store after school. The 8-year-old showed the drugs to two of his friends back at his classroom. One 8-year-old boy sniffed at the crack but the other one alerted a counselor. The boys tried to flush some packets down a bathroom toilet. Police retrieved those packets as well as 8 packets on the 13-year-old's person. All four boys were taken to Children's Hospital of Philadelphia as a precaution. They are expected to be ok. The parent's of the 13-year-old are expected to be questioned. The 13-year-old, a 6th grader, is facing drug charges. He also reportedly tested positive for marijuana at the hospital. Three people have been arrested in connection with a copper theft and arson ring in Delaware and Montgomery Counties in Pennsylvania. 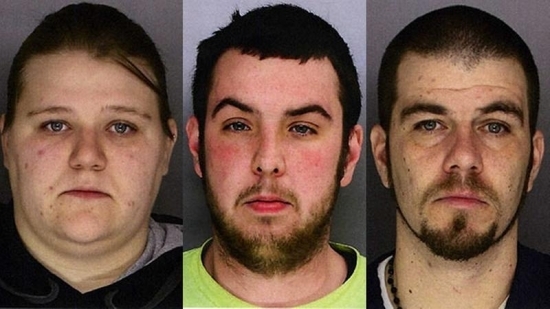 Kevin Colosimo of Douglassville, PA, Ryan Nelson of Aldan, PA and Megan Gawel of Newark, DE (pictured below) are charged with Criminal Conspiracy, Burglary, Arson, Theft and related offenses. The suspects would use websites such as realtor.com to find homes that were either foreclosed or part of an estate sale to indicate they were probably vacant. They would then target those properties to steal copper piping and use the kitchen stoves to light a fire to cover their tracks. Incidents happened in Abington, East Norriton, Limerick and Pottstown in Montgomery County as well as in Swarthmore, Havertown, and Aston in Delaware County. Police found burglary tools and the addresses of the houses in their cars. They were also able to track their cell phone locations. They are each being held in lieu of $1 million bail. A man charged along with several family members in a $20 million insurance fraud scheme killed himself Thursday afternoon in Bucks County. 64-year-old Thomas French was married to family matriarch 67-year-old Claire Risoldi. The family is accused of filing 'questionable' insurance claims following several fires at Claire's home in New Hope that she called 'Claremont.' Officers responded to the 4800 block of Danielle Drive in Buckingham around 4:30 p.m. for the report of a man shooting himself in the driveway. That's where the couple and family had been living while repairs were being made to 'Claremont.' In notes left behind, French proclaimed his innocence in the fraud case and blamed the pressure brought on by the allegations.